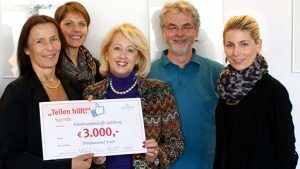 The enterprise recently supported the Pro Mente Kinderseelenhilfe organisation in Salzburg with a donation of 30,000 Euros.The money is urgently needed because over 6,000 children and adolescents around the province of Salzburg suffer from mental illnesses, such as eating disorders, depression, hyperactivity or they are victims of mobbing and mental abuse. The Kinderseelenhilfe organisation offers concerned children and adolescents professional therapeutic support and advice within their own home communities, but the organisation needs donations, such as those from Wenatex, in order to continuously provide these services. Wenatex has collaborated with Pro Mente Salzburg for years now in order to support people with mental impairments, hence their support for Kinderseelenhilfe.The acquisition of the “Bubble-Truck” in 2010 enabled therapists to offer mobile services in towns around the province of Salzburg. For the Wenatex owners Sonja and Hans-Gerd Wernicke, however, social commitments is not only a personal concern, but also an integral part of a social resposibility that one owes to society as an entrepreneur.